Alon Pinkas provides a hopeful take on the growing moderate majority within Israel and the American Jewish community for the Israel Policy Forum. With the OneVoice Movement, we will continue to amplify that moderate voice and leverage it towards creating a peaceful solution. In light of the civil court case surrounding Rachel Corrie’s death this week, NGO Monitor released a statement holding the International Solidarity Movement (ISM) responsible for Corrie’s death. NGO Monitor calls attention to the often violent rhetoric and practice of the ISM with which Corrie was involved. If the ISM continues to encourage members to put themselves in dangerous and life-threatening situations, they will only cause further tragedy. 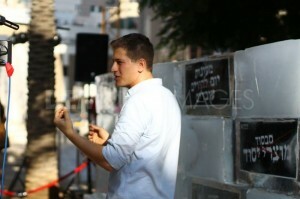 OneVoice Movement Israel spokesperson Tal Harris speaks to Israeli media in front of man-made ice wall, symbolising the freeze in peace negotiations. OneVoice Movement Israel teamed up with J14 protesters in Tel Aviv to link calls for social justice and demands for ending the conflict for the first time. Together, they erected an ice wall to symbolize the “freeze” in peace talks that is becoming ever more costly for Israelis. See OneVoice Movement’s press release for the event after the jump. 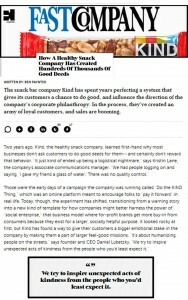 Fast Company‘s Ben Paynter took a lesson in KINDness from KIND‘s Do the KIND Thing movement. He learned of the challenges and rewards that come with attempts to inspire KIND acts across the nation. Dr. Ephraim Sneh is always on target with his strategic analysis of the politics in play in the Middle East. This is no less the case in his latest piece about the state of affairs between Israel and the US vis-a-vis Iran for the Israel Policy Forum. Plan to change. Plan to grow. 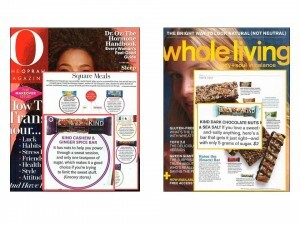 Nutritionists, fashionistas, and make-up artists agree that KIND‘s new Nuts and Spices bars are the best choice for both a healthy energy boost and a deliciously satisfying treat. A friend forwarded this documentary from Tom Shadyac, the director of Bruce Almighty and Ace Ventura, who goes through a crisis of identity and discovers deeper truths about the forces that power our world. Any further description is probably going to make you want to run away, but if you have the patience, you will grow from the perspective and some interesting insights, including interviews with foremost thinkers and philosophers. It certainly connects to what we try to do at KIND, PeaceWorks, and OneVoice. הנני from emetaheret on Vimeo. Daniel Collins reports in Futures Magazine that MF Chairman and CEO Jon Corzine will likely not face jail time despite customers’ wishes.